A senior court source in Spain has denied that a European arrest warrant has been issued for ousted Catalan President Carles Puigdemont. His lawyer made the claim on Belgian State Broadcaster VRT. However, the source says it has not happened, yet, but it is ‘likely’ the warrant will be issued on Friday (November 3). 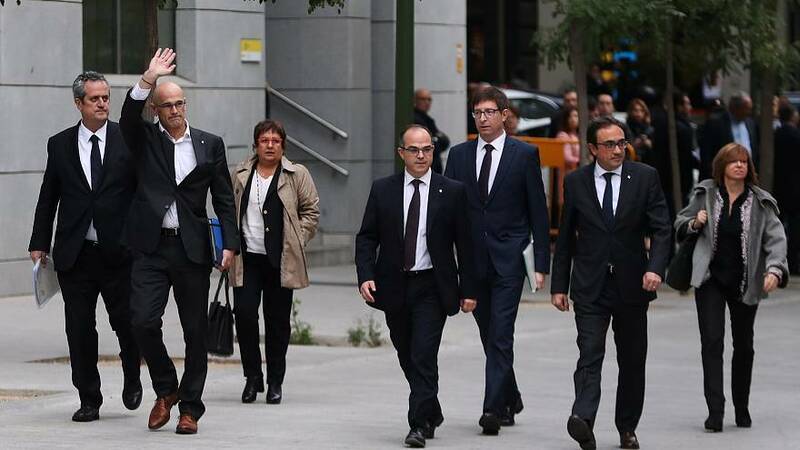 Eight of Catalonia’s separatist leaders have been jailed after appearing in court on charges of sedition, rebellion and misuse of public funds. The judge refused them bail amid fears they may also abscond like the sacked Puigdemont. It comes after Spain’s state prosecutor called for most of the ministers to be jailed pending an investigation and a potential trial over their role in Catalonia’s illegal push for independence. The group of nine includes former regional vice-president Oriol Junqueras. But the prosecutor recommended that one of them, Santi Vila, should be granted bail of 50,000 euros. He stepped down from the Catalan cabinet before a unilateral declaration of independence and has since then been pushing for a negotiated solution with the government. Five senior regional lawmakers and the speaker of the Catalan parliament, Carme Forcadell, were also separately by the Supreme Court which handles the cases of people who enjoy parliamentary immunity. They were given one more week to prepare their defence ahead of a new hearing on November 9. The courts also told the Catalan secessionist leaders to deposit 6.2 million euros by Friday to cover potential liabilities.